I am always happy and content while mixing, cooking, and baking in my kitchen. Preparing food is creative, therapeutic, healing, and it makes my house smell like a home. Cooking is familiar, and I cling to it in times of chaos. Old recipes put me in touch with my ancestors and connect me with the smiling faces of my grandchildren. 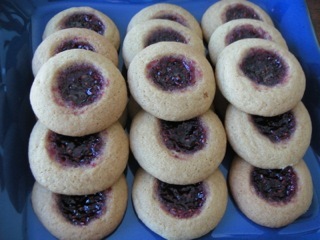 My husband, the boy from the stories in Get a Bigger Wagon, comes directly to the kitchen when he smells these jam-filled cookies baking. Generations of women have baked this recipe to serve with tea or place in lunch boxes. They look great on a Christmas platter. This recipe came from my mother. I have been making these cookies in my home since the early-seventies. Cream butter and sugar together, add eggs and vanilla, beating until smooth. In a separate bowl, mix soda, cream of tarter, salt, and flour. Add dry ingredients to butter mixture, blending thoroughly. This dough will be very stiff. Roll dough into small balls, no more than one inch in diameter. Place on greased cookie sheets, leaving room for cookies to spread. Make impressions in balls with a blunt object and fill each impression with ½ teaspoon of raspberry jam. Bake the cookies in a 350°F oven for 10 to 12 minutes or until golden brown. Leave cookies on the pan for a few minutes after they come out of the oven, before removing them to cooling racks. NOTE: There is absolutely nothing wrong with serving irregular looking cookies. Love and cookies bring joy to the recipient, regardless of presentation. However, a tray of uniformly shaped tea treats with exactly the right amount of jam in the very middle is a thing of beauty and brings a sense of pride to the cook. Using a one-inch scoop helps to keep the cookie size uniform. Making the impressions with a blunt object about ½ an inch across allows for consistency. I use the wooden handle that fell off my soup ladle to make impression in my cookies. Measuring the jam is always better than guessing at the desired amount. I think these cookies look like little wreaths. Try making some this Christmas.